The Horse Council of Nevada will hold its monthly board of directors meeting at the Doc Saddlery, at 7 p.m. The third Wednesday of each month. All members and even non-members are welcome to attend and state what you want the Horse Council to do for you. Among the items to be discussed are: More ideas to make Floyd Lamb Park more usable for equestrians and other park improvement suggestions: the idea of having board meetings elsewhere to save the county the cost of allowing us to use the room when board meeting attendance has dropped significantly: local trail rides and other ideas or activities the Horse Council can host to imprve the pleasure of horse ownership in Southern Nevada. We will also discuss an upcoming meet and greet and a sampler event so horse owners can experience what is required for reining, dressage and maybe one more activity. If you can't attend, please express your desires, or comments to Doc Dascher, president, at mailto:docssaddlery@aol.com or call him at 702-3615456. March 3rd, a Sunday, the Horse Council of Nevada will hold their Tack and Yard Sale from 8am to 2pm. It will be at the corner of Azure and Tenaya. Bring your unwanted everything down to sell. Any club will be offered a free spot to promote their club. Space cost is $10 members and $20 non-members. No cost to shop. See you there. > Wow, what a great weekend at Sandy Valley Ranch. Thanks again to all of those who made it out to trail ride, the barrel racers, and a big thanks to Marilyn Gubler and her staff at the ranch. The weekend was a total success; we are already looking forward to doing this event again sometime next year. The weather cooperated and we had a light breeze the entire weekend to keep us cool as we climbed through the deep sand at the ranch. The barrel race turned out great and we were able to raise some money for Barrels for Bailey. We all enjoyed the riding, but mainly the company of each other. Thanks y'all. The weekend was spectacular. Amy and I had so much fun. It was so wonderful to be with such great people, and to be able to raise money at the same time was a super bonus. 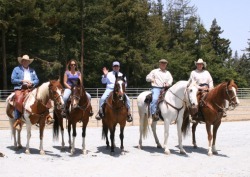 The Sandy Valley Ranch is a wonderful place, Marilyn and her staff made us feel so welcome and special. I would recommend her ranch to anyone wanting a true down home western experience.